With previous development plan stopped mid-operation by DOB permit revocation and landmark designation, applicant sought approval for the creation of a rear addition, a two-story roof addition, and a new brick-faced facade. 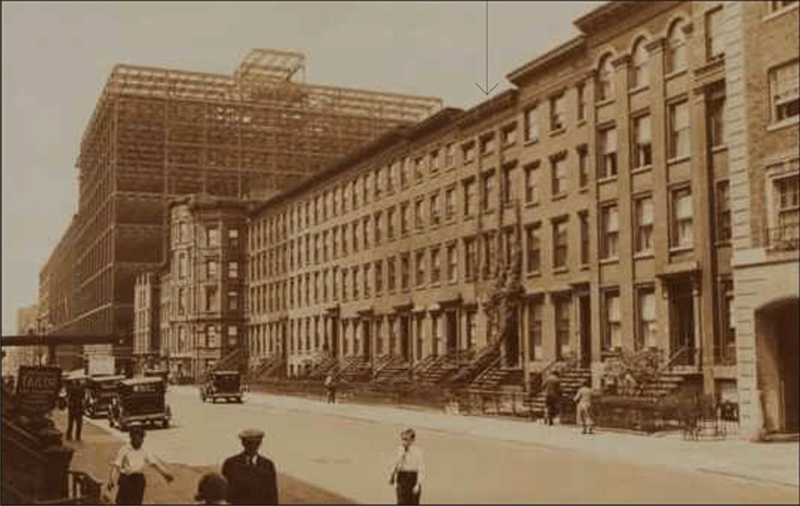 On September 20, 2016, the Landmarks Preservation Commission held a public hearing on a proposal for alterations and additions to 339 West 29th Street, in the Lamartine Place Historic District. The building was constructed in 1847, and underwent alterations in the 20th century. The LLC that owns the property is reported to be controlled by Tony Manoumas. Landmarks designated Lamartine Place, a row of houses on the north side of West 29th Street between Eighth and Ninth Avenues, a historic district in 2009. The district’s significance largely springs from its role in the history of the abolitionist movement, and the site where the homes of prominent anti-slavery activists were attacked during New York’s 1863 draft riots. The wide-scale riots, spurred by the passage of draft laws, led to the mob assaults and murders of many African Americans. 339 West 29th Street was the home to prominent abolitionists Abigail and James Sloan Gibbons, who gave refuge to escaped slaves making their way to Canada. It is the only documented stop on the Underground Railroad in New York City. The building was set on fire by a mob during the riots, and the occupants escaped the burning building by running along the rooftops to a relative’s house at 335 Lamartine Place. In 2005, the owner received a Buildings permit to enlarge the third and fourth floors, and construct a two-story rooftop addition. The enlargement entailed several waivers to the Multiple Dwelling Law. In July of 2009, after some structural work had been completed, Buildings revoked the permit, acknowledging that Buildings did not possess the authority to waive the MDL, and the owners failed to correct the MDL non-compliance. After a series of alterations to the plan, reinstatements of permits and subsequent rescission, Buildings issued a final permit revocation in December of 2010, after the Landmarks district designation. Throughout the process, Buildings also issued a series of violations related to construction safety and work without a permit. The developers sought reinstatement of the permit, which Buildings rejected, stating that owners must now obtain Landmarks approval before reinstatement. The developers appealed Buildings’ determination that it required Landmark’s approval before reinstating the permit, claiming they had a vested right to complete the planned construction. The owners argued that they were exempt from the Landmarks Law because their permit was initially issued before the district designation, and said the permit revocation was an abuse of discretion because Buildings should have issued a stop-work order instead for correctable errors. They claimed that once MDL waivers were properly obtained, it was Buildings duty to reinstate the permit. The Board of Standards and Appeals affirmed Building’s decision. BSA held that the permit was properly revoked, Landmarks approval was necessary before the permit could be reinstated, and that vested rights were not an applicable issue. On appeal, BSA’s ruling was upheld by the New York County Supreme Court and the First Department. At the Landmark hearing, attorney for the applicant Marvin Mitzner detailed the legal history of the work to the building. He said the owner had been “caught in a change of policy,” and said the application currently before Landmarks was part of a “modified process to legalize everything after the fact. Mitzner said the owners had an MDL waiver pending before BSA, awaiting a determination by Landmarks. The applicants were advised by Landmark staff that the original plan, the permit that was revoked by BSA, for a full fifth-floor addition and partial sixth story, would not be acceptable to the Commission. Instead, the applicants proposed to replace the partially constructed addition with a set-back fifth story, and to install a new facade and legalize enlargements to the rear. Mitzner said the proposal before Landmarks represented a “significant improvement” over the building’s current condition, and would “enhance the look of the entire district.” Mitzner stated that, if Landmarks denied the application, the owners were entitled to remove the fifth floor and rear addition, and revert to the stucco finish, as this was the building’s legal condition before they sought a Buildings permit for alterations and before designation. Dami Dan Sehic, of C3D Architecture, testified that the building’s original stoop and cornice had been removed in the 1980s, windows enlarged, and the original entry door replaced with a window. At some point, the front facade was re-clad in stucco to keep water out of the deteriorated structure. Sehic presented the new plans for alterations which included a fifth-floor penthouse set back ten feet from the cornice. The front of the fifth floor would be slanted to make it minimally visible from street thoroughfares. The addition would also be partially visible from a park to the south, especially in winter when there is little foliage. A planned bulkhead would also be visible to pedestrians. The building would be clad in a half-inch brick finish, mounted on metal panels. The first floor would be clad in brownstone and match the adjoining facade at 345 West 29th Street. The brick facade would unify the masonry streetwall of the historic district. The buildings cornice would be restored in fiberglass, and the windows replaced. A fire escape would be installed on the front facade to comply with code requirements for two means of egress. The proposal before Landmarks was one floor lower than the enlargements originally sought from Buildings. Assembly Member Richard Gottfried testified that Landmarks “must not allow the owner to exploit illegal work that would destroy this landmark,” and asserted that “the building must be immediately restored.” Gottfried’s testimony was co-signed by a multitude of elected officials, including Congress members Jerrold Nadler, Carolyn Maloney, and Charles Rangel, several State Senators, Assembly members, several City Council members, Borough President Gale Brewer, Public Advocate Letitia James, and Comptroller Scott Stringer. A representative of Community Board 4 stated that the proposal was “contrary to basic landmark principles,” and “out of context in scale and materials.” The Board asked that the fifth floor be removed from the building, and its base restored to its original state. The 29th Street Neighborhood Association also opposed the application. Pryor Cashman attorney Neil Weisbard, retained by a neighbor, urged Landmarks to reach a determination quickly, as the stalled site had been an “eyesore” in the neighborhood for eight years. In total, there were approximately 20 speakers at the hearing, including area residents, representatives of community organizations, and preservationists, none offering testimony in support of the proposal. Chair Meenaksi Srinivasan stated that Landmarks had received 135 emails in opposition to the project, including a missive from the NAACP. In response to the testimony, Mitzner stated that roofs in the district had been raised and altered over time, and were certainly the same as those traversed by the Gibbons during the Draft Riots. Mitzner also reiterated that it was the owner’s legal entitlement to revert the building to its 2005 state, with the stucco facade and no fifth-floor addition, and that the proposed work before Landmarks would better serve the district. Landmarks counsel Mark Silberman advised that the Commission had the authority to order the removal of the fifth floor, which had no legal status, but the stuccoing appeared to have been done under a valid permit prior to designation. Commissioner Michael Goldblum opined that there was cultural significance vested in the building’s roof, as the “scene of this historic tableau,’ which rendered the Commission’s usual standards of visibility moot. Goldblum disputed the necessity of the fire escape, stating that an internal scissor stair would also meet requirements of the fire code. Goldblum also derided the choice of thin brick as a facade material. Commissioner Michael Devonshire agreed that Landmarks had a responsibility to preserve the integrity of the roofline. LPC: 339 West 29th Street, Manhattan (16-4417) (Sept. 20, 2016) (Architects: C3D Architecture).